Back in 2009, this blog profiled a set called 1937 Thum-Movies, which presented 24-image flip books as quick bursts of baseball action. Pitchers threw a single pitch and hitters took one cut, all in a second or two of flurried paper. It's hard to imagine why Goudey turned its card talents to such an odd set, but remember that theaters attracted plenty of attention (and dollars) during our Great Depression and these booklets echo the motion picture appeal. 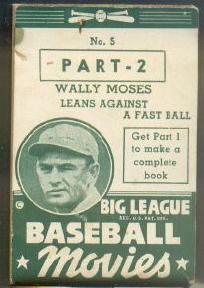 Goudey didn't work hard to create 1938's version of their baseball booklets. They just split 1937's 1/4"-thick version into two 1/8" halves and added player pictures to the front, hoping folks would buy the same quick shots a second time. They proved popular enough at the time that you can find them on eBay in the 21st century, making the set "obscure" instead of "impossibly rare." 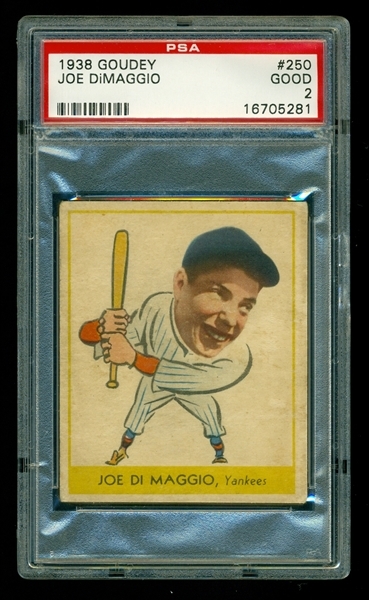 Joe DiMaggio represents this set's prime appeal for modern collectors, as the 1937 and 1938 booklets precede his better-known 1938 Goudey Heads Up "rookie" card. The full 13-player checklist also includes HOFers like Paul Waner, Bob Feller, and Luke Appling. Value: High grade Joe DiMaggio booklets cost a few hundred dollars, but lesser-known players like Moses run $20-30 in low grade. 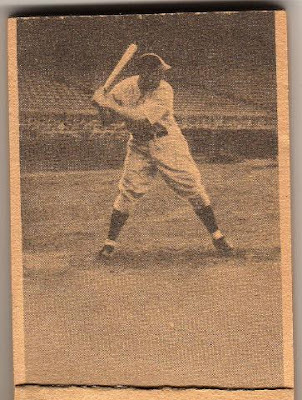 Fakes / reprints: It'd be difficult to reprint an entire flip book, though folks might try it with superstars like DiMaggio. The bio is correct. Wally is left-handed. Very cool find!